The first John Coltrane Memorial Concert (JCMC) was performed in Boston, MA on July 17, 1977, in the Friends of Great Black Music Loft, a performance space for creative arts established by master percussionist Syd Smart. The annual concert then developed through the collective efforts of Syd Smart, bassist Hayes Burnet, and saxophonist Leonard Brown. In 1986, the JCMC moved to Northeastern University, which has served as its home for over two decades, providing a stability that has been essential to the continuation and growth of this unique and important cultural event. From the beginning and now into its 32nd year (2009) of producing concerts, the JCMC’s purpose has been to reflect on the rich musical and spiritual legacy of ‘Trane through contemporary interpretations of his works, to inspire us all to work toward developing our full capacities as human beings, and to work for world peace. 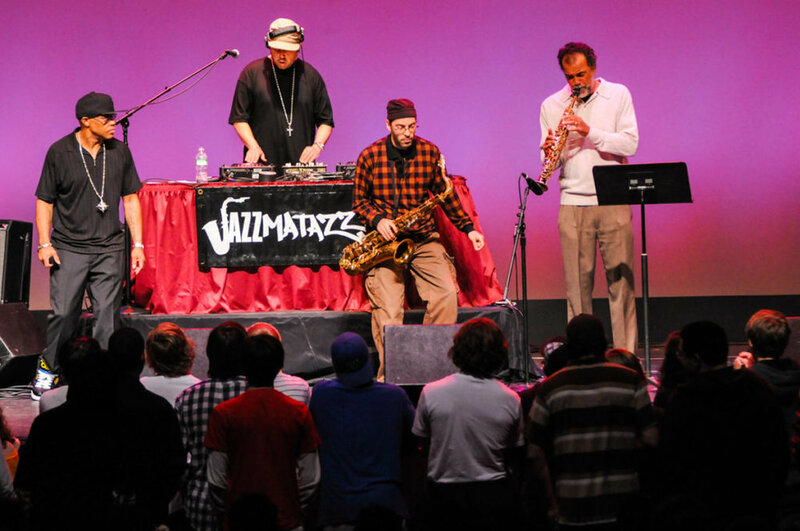 The long list of invited guest artists who have performed with JCMC include McCoy Tyner, Frank Foster, Shirley Scott, George Coleman, Mulgrew Miller, Alvin Batiste, Yusef Lateef, Brother Blue, Danilo Perez, Michael Harper, Pharoah Sanders, Alan Dawson, Terri Lyn Carrington, Ravi Coltrane, and Guru’s Jazzmatazz. The JCMC is the world’s oldest annual performance tribute to the musical and spiritual legacy of John Coltrane and draws a very diverse audience from throughout New England. Since its inception, over 20,000 people have attended the JCMC. Legendary hip-hop messenger Guru along with Superproducer Solar will be the featured performers of this years special tribute to John Coltrane for the JCMC’s 31st anniversary. A hip-hop icon and the first and only rapper to perform at the Royal Albert Hall in London, Guru has illustrated his love for and understanding of the jazz legacy through his critically acclaimed hip-hop and jazz fusion series, Jazzmatazz, which features collaborations with musicians such as Roy Ayers, Donald Byrd, Lonnie Liston Smith, Ramsey Lewis and Branford Marsalis. This artistic performance at the 31st JCMC promises to be innovative, captivating, and compelling.